CivilizationCypriot, Late Bronze 1550 B.C.E. - 1200 B.C.E. 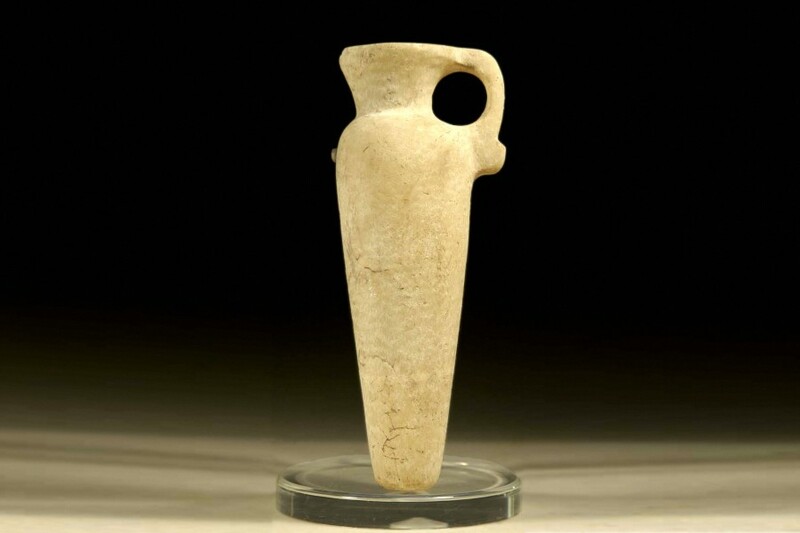 This charming amphoriform vessel is a superb piece of alabaster carving from the Bronze Age occupation of Cyprus. Given that it stands approximately six inches tall and is made from a material considered to be very valuable throughout the ancient world, it would have been designed to hold an unguent, precious oil or related substance. It is an almost perfect miniature copy of a full-sized amphora, with a pointed base widening to rounded shoulders and a constricted neck flaring to a wide-lipped mouth. It bears a single knop-based round handle which runs between one shoulder and the level of the lip. The surface is plain white, with clear signs of tool texturing and a certain patination from usage and burial over a prolonged period of time. In some respects it resembles the alabaster carvings that characterise Egypt during this period, and indeed this is no coincidence. The period in question was a dynamic one for the Cypriots in light of the Hyksos occupation of the Eastern Mediterranean, followed by a comparatively pacific period in which trade and commerce flourished more than warfare and aggression. The influence of Egypt in arts and politics reached a peak in 1500 B.C.E. when Egypt fell under the aegis of Egyptian administration. This set the scene for the Phoenician trade networks which went on to dominate the entire region, up as high as Cornwall in England, and far down the West African coast. By the end of the 2nd millennium BC the island was becoming fully urbanised and incorporated into the international community and using this to boost internal prosperity. It thus came under the influence of the Hittites, although full occupation did not take place until 1200 B.C.E., and even then there was negligible influence on the Cypriot international (and imported) art styles which had become entrenched by this point. This is therefore a symbol not only of this ancient culture, but also of a lost age of elegant conspicuous consumption and international cosmopolitanism. This would be an excellent addition to any good collection of ancient art.